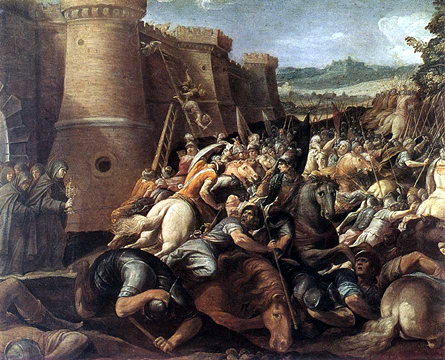 In 1234, the army of Frederick II was devastating the valley of Spoleto, the soldiers, preparatory to an assault upon Assisi, scaled the walls of San Damiano by night, spreading terror among the community. Clare, calmly rising from her sick bed, and taking the ciborium from the little chapel adjoining her cell, proceeded to face the invaders at an open window against which they had already placed a ladder. It is related that, as she raised the Blessed Sacrament on high, the soldiers who were about to enter the monastery fell backward as if dazzled, and the others who were ready to follow them took flight. It is with reference to this incident that St. Clare is generally represented in art bearing a ciborium. Co-foundress of the Order of Poor Ladies, or Clares, and first Abbess of San Damiano; born at Assisi, July 16, 1194; died there August 11, 1253. As a child she was most devoted to prayer and to practices of mortification, and as she passed into girlhood her distaste for the world and her yearning for a more spiritual life increased. She was eighteen years of age when St. Francis came to preach the Lenten course in the church of San Giorgio at Assisi. Inspired by his words, she sought him out secretly and begged him to help her that she too might live "after the manner of the holy Gospel". St. Francis, who at once recognized in Clare one of those chosen souls destined by God for great things, and who also, doubtless, foresaw that many would follow her example, promised to assist her. On Palm Sunday night Clare secretly left her father's house, by St. Francis's advice and, accompanied by her aunt Bianca and another companion, proceeded to the humble chapel of the Porziuncula, where St. Francis and his disciples met her with lights in their hands. Clare then laid aside her rich dress, and St. Francis, having cut off her hair, clothed her in a rough tunic and a thick veil, and in this way the young heroine vowed herself to the service of Jesus Christ. This was March 20, 1212. Clare was joined by her younger sister Agnes, whom she was instrumental in delivering from the persecution of their infuriated relatives. St. Francis rebuilt the poor chapel of San Damiano and established it as a place for the first community of the Order of Poor Ladies, or of Poor Clares, as this second order of St. Francis came to be called. St. Clare and her companions had no written rule to follow beyond a very short formula vitae given them by St. Francis, and which may be found among his works. Some years later, apparently in 1219, during St. Francis's absence in the East, Cardinal Ugolino, then protector of the order, afterwards Gregory IX, drew up a written rule for the Clares at Monticelli, taking as a basis the Rule of St. Benedict, retaining the fundamental points of the latter and adding some special constitutions. This new rule, which, in effect if not in intention, took away from the Clares the Franciscan character of absolute poverty so dear to the heart of St. Francis and made them for all practical purposes a congregation of Benedictines, was approved by Honorius III (Bull, "Sacrosancta", December 9, 1219). When Clare found that the new rule, though strict enough in other respects, allowed the holding of property in common, she courageously and successfully resisted the innovations of Ugolino as being entirely opposed to the intentions of St. Francis. The latter had forbidden the Poor Ladies, just as he had forbidden his friars to possess any worldly goods even in common. Owning nothing, they were to depend entirety upon what the Friars Minor could beg for them. This complete renunciation of all property was however regarded by Ugolino as unpractical for cloistered women. When, therefore, in 1228, he came to Assisi for the canonization of St. Francis (having meanwhile ascended the pontifical throne as Gregory IX), he visited St. Clare at San Damiano and pressed her to so far deviate from the practice of poverty which had up to this time obtained at San Damiano, as to accept some provision for the unforeseen wants of the community. But Clare firmly refused. Gregory, thinking that her refusal might be due to fear of violating the vow of strict poverty she had taken, offered to absolve her from it. "Holy Father, I crave for absolution from my sins", replied Clare, "but I desire not to be absolved from the obligation of following Jesus Christ". The heroic unworldliness of Clare filled the pope with admiration, as his letters to her, still extant, bear eloquent witness, and he so far gave way to her views as to grant her on September 17, 1228, the celebrated Privilegium Paupertatis which some regard in the light of a corrective of the Rule of 1219. The original autograph copy of this unique "privilege"-- the first one of its kind ever sought for, or ever issued by the Holy See -- is preserved in the archive at Santa Chiara in Assisi. The text is as follows: "Gregory Bishop Servant of the Servants of God. To our beloved daughters in Christ Clare and the other handmaids of Christ dwelling together at the Church of San Damiano in the Diocese of Assisi. Health and Apostolic benediction. It is evident that the desire of consecrating yourselves to God alone has led you to abandon every wish for temporal things. Wherefore, after having sold all your goods and having distributed them among the poor, you propose to have absolutely no possessions, in order to follow in all things the example of Him Who became poor and Who is the way, the truth, and the life. Neither does the want of necessary things deter you from such a proposal, for the left arm of your Celestial Spouse is beneath your head to sustain the infirmity of your body, which, according to the order of charity, you have subjected to the law of the spirit. Finally, He who feeds the birds of the air and who gives the lilies of the field their raiment and their nourishment, will not leave you in want of clothing or of food until He shall come Himself to minister to you in eternity when, namely, the right hand of His consolations shall embrace you in the plenitude of the Beatific Vision. Since, therefore, you have asked for it, we confirm by Apostolic favor your resolution of the loftiest poverty and by the authority of these present letters grant that you may not be constrained by anyone to receive possessions. To no one, therefore, be it allowed to infringe upon this page of our concession or to oppose it with rash temerity. But if anyone shall presume to attempt this, be it known to him that he shall incur the wrath of Almighty God and his Blessed Apostles, Peter and Paul. Given at Perugia on the fifteenth of the Kalends of October in the second year of our Pontificate." That St. Clare may have solicited a "privilege" similar to the foregoing at an earlier date and obtained it vivâ voce, is not improbable. Certain it is that after the death of Gregory IX Clare had once more to contend for the principle of absolute poverty prescribed by St. Francis, for Innocent IV would fain have given the Clares a new and mitigated rule, and the firmness with which she held to her way won over the pope. Finally, two days before her death, Innocent, no doubt at the reiterated request of the dying abbess, solemnly confirmed the definitive Rule of the Clares (Bull, "Solet Annuere", August 9, 1253), and thus secured to them the precious treasure of poverty which Clare, in imitation of St. Francis, had taken for her portion from the beginning of her conversion. The author of this latter rule, which is largely an adaptation mutatis mutandis, of the rule which St. Francis composed for the Friars Minor in 1223, seems to have been Cardinal Rainaldo, Bishop of Ostia, and protector of the order, afterwards Alexander IV, though it is most likely that St. Clare herself had a hand in its compilation. Be this as it may, it can no longer be maintained that St. Francis was in any sense the author of this formal Rule of the Clares; he only gave to St. Clare and her companions at the outset of their religious life the brief formula vivendi already mentioned. St. Clare, who in 1215 had, much against her will been made superior at San Damiano by St. Francis, continued to rule there as abbess until her death, in 1253, nearly forty years later. We know that she became a living copy of the poverty, the humility, and the mortification of St. Francis; that she had a special devotion to the Holy Eucharist, and that in order to increase her love for Christ crucified she learned by heart the Office of the Passion composed by St. Francis, and that during the time that remained to her after her devotional exercises she engaged in manual labor. After St. Francis's death the procession which accompanied his remains from the Porziuncula to the town stopped on the way at San Damiano in order that Clare and her daughters might venerate the pierced hands and feet of him who had formed them to the love of Christ crucified -- a pathetic scene which Giotto has commemorated in one of his loveliest frescoes. On August 11, 1253, the holy foundress of the Poor Ladies passed peacefully away amid scenes which her contemporary biographer has recorded with touching simplicity. The pope, with his court, came to San Damiano for the saint's funeral, which partook rather of the nature of a triumphal procession. The Clares desired to retain the body of their foundress among them at San Damiano, but the magistrates of Assisi interfered and took measures to secure for the town the venerated remains of her whose prayers, as they all believed, had on two occasions saved it from destruction. Clare's miracles too were talked of far and wide. It was not safe, the Assisians urged, to leave Clare's body in a lonely spot without the walls; it was only right, too, that Clare, "the chief rival of the Blessed Francis in the observance of Gospel perfection", should also have a church in Assisi built in her honor. Meanwhile, Clare's remains were placed in the chapel of San Giorgio, where St. Francis's preaching had first touched her young heart, and where his own body had likewise been interred pending the erection of the Basilica of San Francesco. Two years later, September 26, 1255, Clare was solemnly canonized by Alexander IV, and not long afterwards the building of the church of Santa Chiara, in honor of Assisi's second great saint, was begun under the direction of Filippo Campello, one of the foremost architects of the time. On October 3, 1260, Clare's remains were transferred from the chapel of San Giorgio and buried deep down in the earth, under the high altar in the new church, far out of sight and reach. After having remained hidden for six centuries -- like the remains of St. Francis -- and after much search had been made, Clare's tomb was found in 1850, to the great joy of the Assisians. On September 23 in that year the coffin was unearthed and opened, the flesh and clothing of the saint had been reduced to dust, but the skeleton was in a perfect state of preservation. Finally, on the September 29, 1872, the saint's bones were transferred, with much pomp, by Archbishop Pecci, afterwards Leo XIII, to the shrine, in the crypt at Santa Chiara, erected to receive them, and where they may now be seen. one day in the heavenly Kingdom. Indeed I count everything as loss because of the surpassing worth of knowing Christ Jesus my Lord. For His sake I have suffered the loss of all things, and count them as refuse, in order that I may gain Christ and be found in Him, not having a righteousness of my own, based on law, but that which is through faith in Christ, the righteousness from God that depends on faith; that I may know Him and the power of His resurrection, and may share His sufferings, becoming like Him in His death, that if possible I may attain the resurrection from the dead. Not that I have already obtained this or am already perfect; but I press on to make it my own, because Christ Jesus has made me His own. Brethren, I do not consider that I have made it My own; but one thing I do, forgetting what lies behind and straining forward to what lies ahead, I press on toward the goal for the prize of the upward call of God in Christ Jesus. Then Peter said in reply, "Lo, we have left everything and followed you. What then shall we have?" Jesus said to them, "Truly, I say to you, in the new world, when the Son of man shall sit on his glorious throne, you who have followed me will also sit on twelve thrones, judging the twelve tribes of Israel. And every one who has left houses or brothers or sisters or father or mother or children or lands, for my name's sake, will receive a hundredfold, and inherit eternal life. A recipe from a monastery in Coimbra, Portugal, this has been preserved for generations. Rub butter into the flour and add a bit of very cold water until a pliable dough is obtained. Cover and refrigerate until filling is finished. Melt the sugar in a little water and boil until thick. Add the ground almonds and yolks. Mix and simmer while stirring until very thick. Roll out the dough to 1/8 - inch (3mm) thickness, cut into 3 - inch (8cm) diameter circles. Divide the filling among them, placing it in the middle of each circle. Wet the edges and fold over, forming a half - moon shape. Seal and brush with the beaten egg and bake on a greased cookie sheet at 400°F (200°C) until golden, about 20 minutes. When baked, dredge in sugar. from Cooking with the Saints, Ignatius Press. Pilgrims to San Damiano, the first monastery of the Poor Clares in Assisi, are shown a picturesque spot that tradition has christened "the garden of St. Clare." It is not difficult to imagine the Seraphic Mother working there, tending her flowers, praising God, perhaps even humming softly St. Francis' "Canticle of the Creatures." There is another garden where St. Clare of Assisi can be found, - the garden of prayer. Here, too, she meets us as an accomplished gardener, a proficient guide who is willing to assist us in cultivating the soil in order to enjoy the flowers and savor the fruits of prayer. Our Lord declared: The Seed is the Word. Thus St. Clare invites us to fill our garden of prayer with the Good Seed of the Word of God. Her own prayer was deeply Scriptural. She immersed herself in the PSALMS, the masterwork of prayer in the Old Testament (CATECHISM 2595) and prayed with depth and devotion the OUR FATHER, the summary of the whole Gospel (Tertullian) Welcoming the Word in the good soil of a recollected heart, praying WITH the Word and IN the Word, St. Clare's garden of prayer flourished. If prayers of petition and intercession are the annuals in our garden of prayer, then Praise and Thanksgiving are its perennials, The Seraphic Mother summarized the need for continual praise and thanksgiving when she told her Sisters: ALWAYS and in ALL THINGS, God must be praised! (Process of Canonization) So well did she live her own advice that she died with one last act of thankful praise on her lips: May You be blessed, O Lord, for having created me! What was The Foundation that watered St. Clare's garden of prayer? It was the Eucharist, the source and summit of Christian worship, life and mission. In the Eucharistic Liturgy is found every form of prayer. Here we "gather up" the heart, recollecting our whole being under the prompting of the Holy Spirit. (CATECHISM 2711) Here we unite ourselves to Christ as He offers perfect praise and thanksgiving to the Father. Here the Good Seed of the Word is lavishly sown. The Eucharist is the food of faith which strengthens us for the spiritual combat. In the Eucharist, communion with God becomes a reality cherished in adoring silence. Is it any wonder that the Seraphic Mother did all she could to foster devotion to the Eucharistic mystery? Our catechesis today deals with Saint Clare of Assisi, the great mystic, friend of Saint Francis and foundress of the Poor Clare Nuns. Born to a family of means, Clare chose to embrace a life of radical poverty, chastity and trust in God’s providence; received by Francis, she consecrated herself completely to Christ and, together with her companions, embraced the common life in the Church of San Damiano in Assisi. The spiritual friendship between Clare and Francis reminds us of how the great saints have found in such friendships a powerful impetus to greater love of Christ and renewed strength in the pursuit of the way of perfection. Clare’s Rule, the first written by a woman, sought to preserve and foster the Franciscan charism in the growing number of women’s communities which followed the example of Francis and her own. Her spirituality, nourished by the Eucharist, was based on the loving contemplation of Christ as the source and perfection of every virtue. Saint Clare shows us the value of consecrated virginity as an image of the Church’s love for her divine Spouse, and the decisive role played by courageous and faith-filled women to the Church’s renewal in every age.